As David Page already noted, Leo and I are taking over responsibility of building PostGIS windows one-click installers/stack builder from Mark Cave-Ayland. The PostGIS 1.4 windows packaging was a little late in coming this time since it was our first and also some things changed in the PostGIS packaging for 1.4. Even so we made some mistakes such as statically compiling libproj in with the postgis-1.4.dll and forgetting some new images in the packaged html help, which we will fix in 1.4.1 release. Mark will still be providing a supporting role and helping out when we screw up or helping us if we run into compile issues as we go along so he's not going away; he will be a great safety net. When Mark started his role a long time ago, he was as many would like to say "Very entrenched in the dark side," and over the years, he has seen the light. As a result, these moments of catching issues in the PostGIS release cycle that effect windows users such as troubleshooting the memory bug in the loader files that affected Windows Vista users and testing on various Windows OS, has fallen on us, because well we have access to all windows os. It also became painful for Mark to walk in the shadow of darkness once he had seen the light. Luckily we are still windows addicts so this having to constantly test on Windows and building for Windows is something we would naturally do anyway and yes as shocking as it sounds we do run some production PostgreSQL apps on windows and it works pretty well, thank you very much. We don't expect this to change any time soon. The PostGIS steering committee has agreed to be good and not be adding new functions between micro releases of PostGIS as we have done in the past and as we've been smacked around for. As part of that change, from PostGIS 1.4 moving forward each micro version will overwrite the previous micro version in the MS Windows registry. E.g. 1.4.1 will overwrite 1.4.0 so no need to uninstall the old and reinstall to get rid of registry junk. Just install on top of your existing 1.4. As of PostGIS 1.4 it is possible to run different versions of PostGIS in different databases on teh same PostgreSQL server install since the .so/.dll from minor to minor have unique names (naming is postgis-1.4.so (postgis-1.4.dll), postgis-1.5.so etc). This is mostly useful for testing and comparing different versions of PostGIS before you officially upgrade and if you have several different spatial apps using different databases, you don't risk breaking them all at once. PostGIS is now an official incubation project of OSGEO. Things are still being drafted. But I guess that means our PostGIS defacto steering committee composed of Kevin, Paul, Mark, and myself is now more or less official. We just submitted first revision of chapter 6 of our upcoming book PostGIS in Action and are working on our second revision of that chapter. The second revision will most likely be split into 2 chapters because its too long for a single chapter. It will cover loading/exporting various format types of spatial data and everything you never wanted to know about spatial reference systems. We also submitted the second revision of the upcoming RefCardz DZone Essential PostgreSQL. Not sure when that will be released since we are already a bit behind schedule. I imagine we will have a couple more iterations of that before its done. It is really hard to cram into six pages the most important things that every PostgreSQL user should know and all the exciting stuff in PostgreSQL without feeling like you are leaving something critical out. I'm always amazed how people manage to write books by themselves. If you think for each chapter you go thru 4-5 revisions and each subsequent revision is about 20-50% of the previous, that's a lot. Leo and I are writing together and its still a struggle though its been fun. I guess writing together has its own challenges because you are constantly cutting each others stuff out and arguing over what is important and what is not. We have managed to not have too many heated debates that would spoil dinner. This is good since Leo does the cooking because he thinks I'm too absent-minded to be capable of complex tasks like cooking. Just read that Microsoft has formed a new foundation called CodePlex foundation, presumably to spinoff their Code plex site and allow it to stand separately from Microsoft. The mission appears to be to allow an easier avenue for developers working for proprietary software companies to contribute to open source projects. Monty has some details about this on his blog The CodePlex Foundation: Why is Microsoft founding it?. The line up of people they have on their advisory board (including Monty) and board of directors is interesting CodePlex About. I'm particularly happy that Miguel De Icaza is on the board since he is one of my favorite people and I believe shares my pragmatic ideals on the synergy between open source and non-open source software. I wonder what it takes to get on this board. It would be really nice if someone in the PostgreSQL community were on this board just to ensure the needs of the PostgreSQL community (especially our growing number of windows users) is well represented. As to the argument of Monty's that software for sell is dying, not sure I quite agree though haven't given it much thought. Certainly I would like to think that service for sell is rising since that's the business we are in and enjoy most. One thing I believe is that software is getting more complicated and people expect more. With that said even as a company that sells software, you would be foolish not to try to leverage on the open source software out there that fits nicely into your codebase. You just won't be able to compete even with the sole proprietor next door who is with it. First I would first like to give this caveat that yes I am a pro Microsofter. Always was, and really can't see myself changing. Over the years I have seen myself change along with the face of Microsoft. I no longer use just Microsoft products, but partake too of all the good things that the world has to offer, much of which thank goodness is free in the sense of not costing as well as not having restrictive uses, and fitting often more nicely with our clients codebase and general requirements than closed source software. I have observed over the years, that Microsoft has been embracing PHP and basically trying to make the world forget about ASP. This all seemed puzzling to me at first and then realized it makes perfect logistical sense. ASP is a dead product and even as the owner of said dead product, you want to get your customer off of it as quickly as possible so you don't have to waste money supporting it. That is why the PostgreSQL and other communities push people to upgrade. All those die-hard ASP fans hated ASP.NET. 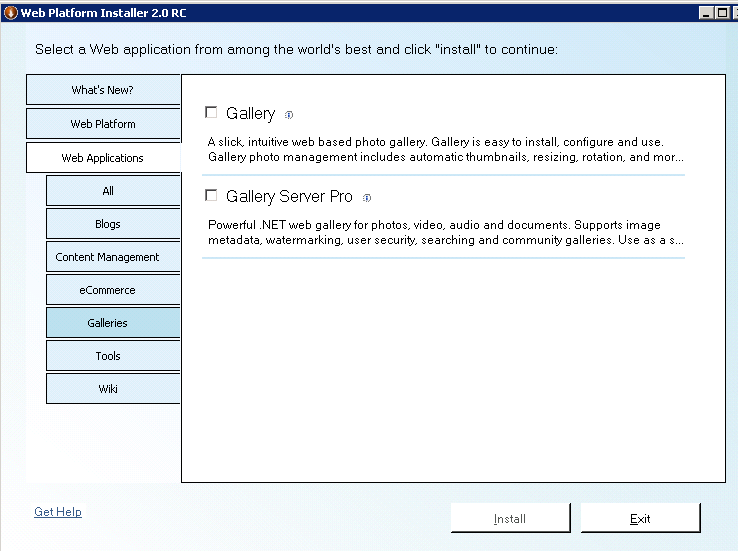 ASP.NET was too complicated for their needs. Ironically the transition for many people from ASP to PHP was a much easier one than from ASP to ASP.NET. PHP also had the advantage of running pretty consistently on Linux as it did on Windows. 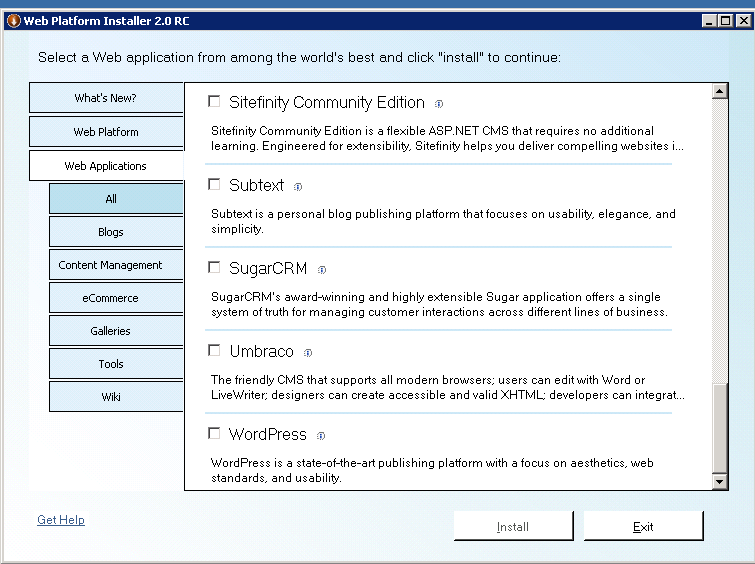 Work still needs to be done to allow ASP.NET that luxury. I happen to like both for very different reasons and workflows. Last week I noticed what appears to be an acceleration in whatever company Microsoft is turning into. I wanted to try out the new SQL Server 2008 Reporting Services by downloading the free SQL server 2008 Express with Advanced Services. Last time I downloaded it the install of SQL Server 2008 express was a bit painful, but this time I spent a lot of time puzzled. 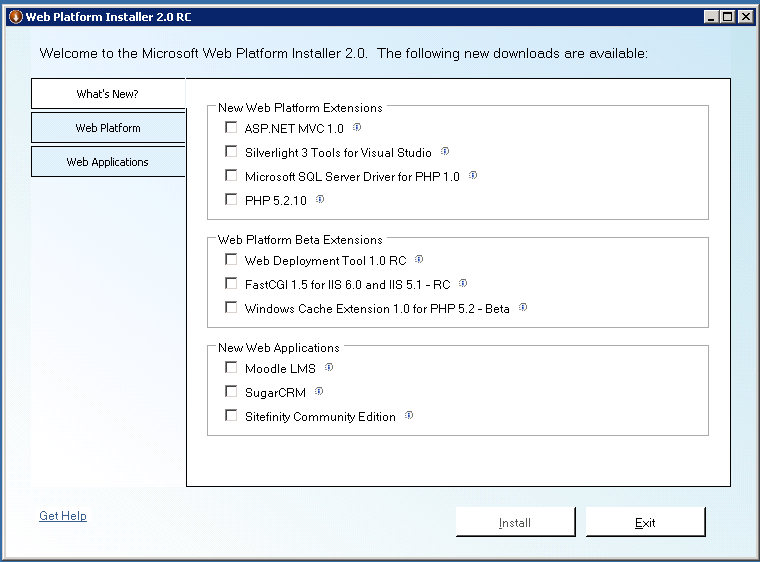 You see I had to download this thing called a Web Platform Installer. It recognized the dependencies I was missing and dowloaded it for me. What puzzled me however were these screens. The strange thing is that a lot of the PHP side of products are MySQL centric and don't even work with SQL Server to my knowledge and much of it doesn't work with PostgreSQL (except for Moodle, Gallery, the variant of Drupal they packaged Acquia Drupal - claims to only support MySQL. What happened to plain Drupal that supports PostgreSQL). So on the one hand I was glad that Microsoft was embracing open source and on the other hand I was irritated by the choice of offerings. I'm not sure if I can blame Microsoft for the lack of applications I can actually use. I'm sure a poll was done and this is what people commonly use and being customer centric as they are that is what they put out. One of the small little treats provided in PostgreSQL 8.4 is the new pg_terminate_backend function. In the past when we wanted to kill runaway postgresql queries issued by a database or user or hmm us, we would call the pg_cancel_backend function. The problem with that is it would simply cancel the query in the backend process, but often times the offending application would simply launch the same query again. In PostgreSQL 8.4 a new function was introduced called pg_terminate_backend. This doesn't completely replace pg_cancel_backend, but basically does what you do when you go into say a Windows Task manager and kill the offending postgres process or on Linux, you call a kill command on a postgres process. Its nicer in the sense that you can do it all within PostgreSQL and you can use the pg_stat_activity query to help you out a bit. Also you don't run the risk as easily of killing the root postgres process and killing the postgres service all together. Below are the ways we commonly use these functions. One of the features I really love about PostgreSQL which I miss when working with SQL Server, is the ability to call a function that does something from within a query. This feature makes SQL so much more powerful. Terminating backends is also useful for freeing up memory from idle postgres processes that for whatever reason were not released or if you need to rename a database and need to kill all live connections to a database to do so. One thing we have noticed with the baseball approach to database management is that it doesn't always play well with pooled connection like things. For example in one PHP app we had that uses pooled connections, the connections became stale. Or at least we think this is the culprit. So you sometimes have to restart the app, or it sometimes gives annoying messages to the user until the dead connections are released. With that said, we still try the slap on the wrist before reaching for the baseball bat. Its always nice to have an easy to swing baseball bat handy though. Below is what the structure of your table looks like.